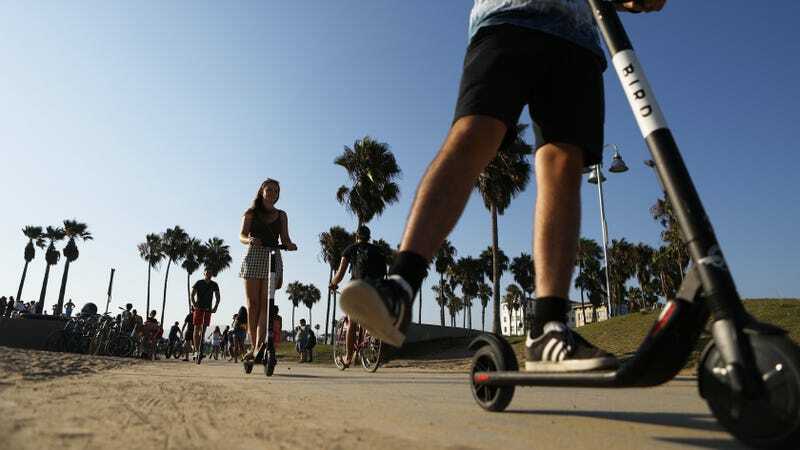 Electric scooters have become wildly popular, thanks to single-named companies like Bird, Scoot, and Lime creating easy-to-ride, if legally iffy, scooter rental services in cities across the U.S. But a new study out Friday is seemingly the first to quantify a drawback to these convenient devices: lots of riders are getting hurt and ending up in the emergency room. They decided to examine medical records from the emergency departments of two hospitals affiliated with UCLA, including one in Santa Monica. They singled out cases that took place between September 1, 2017 to August 31, 2018, using search terms such as “scooter,” “Bird,” and “Lime,” to find them. All told, there were 249 people who visited these emergency rooms with injuries associated with e-scooters within that year. The vast majority, 91 percent, had gotten hurt while riding, usually by falling. And some got seriously hurt. “Although only six percent of patients were admitted to the hospital, nearly 1 in 3 patients arrived by ambulance. 80 percent had an imaging test (x-rays or CT-scans), and fractures and head injuries were common among ED patients,” lead author Tarak Trivedi, an emergency medicine physician at Ronald Reagan UCLA Medical Center, told Gizmodo via email. Trivedi and his team also conducted a simple, observational survey of nearly 200 scooter riders in the wild, looking to see whether riders were being safe. Barely 5 percent of these riders used helmets (a similar percentage of riders in the emergency department reported helmet use, though helmet status was unknown in 63 percent of cases). Just over a quarter of riders rode on the sidewalk, a legal no-no in most areas, while 9 percent broke traffic laws and 8 percent rode with someone in the back. Eleven percent were also under the age of 18, flouting the age and license restrictions set by companies like Bird and Lime. Another way companies could help researchers like Trivedi is by sharing mileage data so it’d be easier to quantify the injury rate of scooter use. That would let them better understand just how risky these devices generally are. Trivedi and his colleagues may also look at outpatient visits related to e-scooter injuries in the near future, filling in more gaps. Those tips, as might be obvious, include wearing a helmet, staying off the sidewalks to avoid hurting other people, and sticking to one person per scooter.